Abstract: The adoption of the Common Core State Standards for Mathematics (CCSSM) has created a need for many teachers and school districts to adapt their current curricular materials. Using the methods of design-based implementation research (Penuel et al., 2011), this project partnered with high school algebra teachers, district curriculum staff, and university researchers to support teachers in the selection and use of high-quality mathematical tasks. This participatory design process yielded a set of principles for task analysis that considered qualities of CCSSM alignment, cognitive demand, language, and technology. Results indicate a need for careful guidance in task rating, attention to teachers’ desires to further modify tasks, and possible benefits for task implementation. 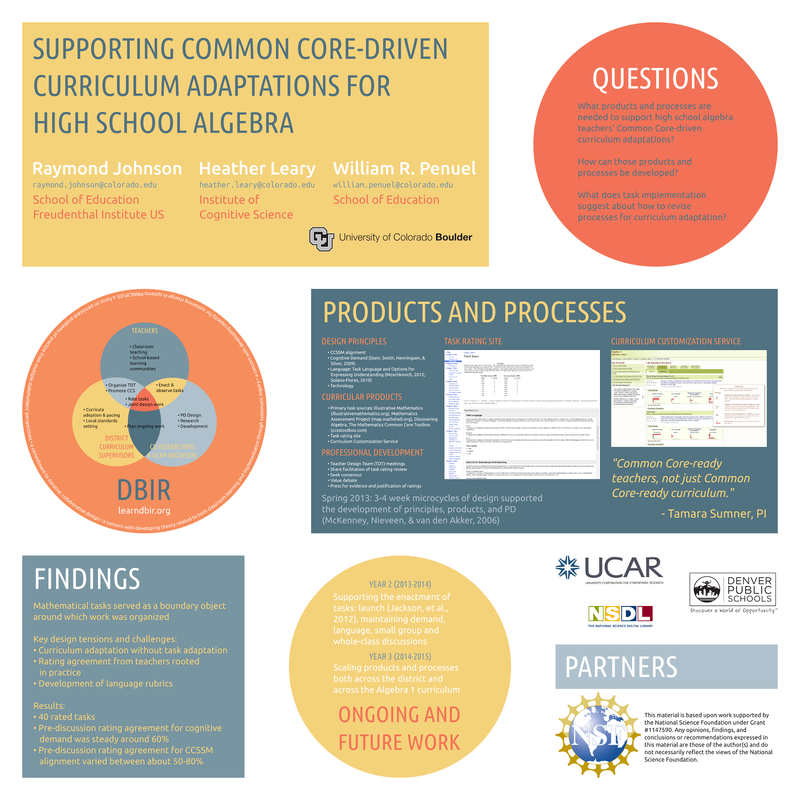 This poster broadly summarizes the first year of an ongoing project that brings together education researchers, web developers, school district curriculum supervisors, and a team of district algebra teachers to support Algebra 1 teachers' curriculum adaptations to meet the new demands of the Common Core State Standards. To give a little context to the poster, you can see our research questions address not only the what of curriculum adaptation, but the how - ideally, we want to theorize ways these kinds of collaborations can work and a process other districts can follow to bring these kinds of curriculum changes to scale. The perspective we take on our research is design-based implementation research, or DBIR. You can learn more about DBIR at learndbir.org. Design research has typically been carried out at the classroom level, and DBIR takes much of that thinking to a larger educational system. Too often professional development is only applied to teachers who struggle to implement new ideas and tools without broader institutional support. DBIR tries to change that by engaging stakeholders throughout the system to tackle persistent problems of practice in a way that is scalable and sustainable. Design work with curriculum has been theorized by McKenney, Nieveen, and van den Akker (2006) to focus on iterative cycles of work towards the development of three products: design principles, curricular products, and professional development. These are in order of importance and reflect our values in this project. Our first priority is not a higher quality curriculum, although that is a strongly desired outcome. But to reach that outcome, our highest priority is giving teachers a set of principles for evaluating the quality of the materials they use and choose from every day. With these principles in place, quality resources to choose from, and a professional development program to tie the two together, we aim to create curriculum reform in a way that's sustainable. Two web-based products have supported this work: first, the Task Rating site, where teachers evaluate tasks given our co-designed principles. The rating data collected in this site is used in professional development for reflection and debate. The data also informs our second web tool, the Curriculum Customization Service. This site catalogs the high-quality mathematical tasks identified in the rating process alongside digital versions of the district curriculum as well as resources from NSDL, the National Science Digital Library. Teachers with accounts on the service can save resources into playlists for lesson and unit plans and use an uploading and sharing tool to share their curriculum with colleagues. Our findings are preliminary. First, we found that mathematical tasks acted as a boundary object (Star & Griesemer, 1989; Star, 2010), an object around which we could organize our work despite each community (researchers, district supervisors, teachers, and web developers) having somewhat different perspectives on the role of mathematical tasks. We found some tensions in our first year of work. A persistent tension related to the modification of mathematical tasks. Although the goal of the project was to adapt the curriculum, there was an effort taken to have teachers consider tasks as written. This was difficult for teachers due to another tension, their consideration of tasks given the unique contexts of their classrooms. While we value those contexts, rating tasks using the design principles was difficult to do consistently when teachers saw not the task as written, but a different version of the task that they would likely enact. Lastly, the most difficult design principles to develop were those that evaluated the language used in tasks. Through multiple revisions, rubrics for rating task language incorporated more structure from both research and an understanding of ongoing district effort to support language learning. At year's end, we had collectively rated 40 tasks, most of which were cataloged in the Curriculum Customization Service. We also looked for consistency in ratings. Rater agreement varied depending on the principle applied to the task and the task itself. Preliminary measures indicated raters were generally in 60% agreement in their rating of cognitive demand, and alignment to the Common Core varied between 50%-80%. This work to measure agreement is ongoing and do not support any conclusions as yet. The second year of the project has focused on supporting the implementation of tasks, using ideas like the task launch (Jackson et al., 2012) and a focus on promoting quality classroom discussions. We expect our work next year will be the difficult work of scaling, within the district to other Algebra 1 teachers and possibly to those in other partner districts. Acknowledgement: This work was supported by a grant from the National Science Foundation (Award #1147590). The opinions expressed herein are those of the authors and do not necessarily reflect those of the NSF. Jackson, K. J., Shahan, E. C., Gibbons, L. K., & Cobb, P. (2012). Launching complex tasks. Mathematics Teaching in the Middle School, 18(1), 24–29. McKenney, S. E., Nieveen, N., & van den Akker, J. (2006). Design research from a curriculum perspective. In J. van den Akker, K. Gravemeijer, S. E. McKenney, & N. Nieveen (Eds. ), Educational design research (pp. 67–90). New York, NY: Routledge.